Earlier today, Facebook released its Facebook Camera app, a standalone job that allows users to shoot, filter and upload photos to the social network. This app comes just weeks after Facebook announced plans to acquire Instagram for $1B and raises the question: Why does the company need two different apps to do essentially the same thing? But, after using the app for a few hours, we’ve come to the conclusion that it has little, if anything, to do with Instagram, and everything to do with Facebook’s precarious toehold on iOS. First of all, there’s the timeline of the Instagram deal. Reportedly hashed out over a weekend between Facebook CEO Mark Zuckerberg and Instagram’s Kevin Systrom. This means that the decision to move ahead, or keep moving ahead, with the Facebook Camera project likely didn’t come into play with the Instagram deal. Instead, this project likely began some time shortly after Facebook acquired Dutch software house Sofa in July of last year. Sofa is known for its design-forward work on apps like Versions and Kaleidoscope. Sofa’s fingerprints, including founder Dirk Stoop — who penned the Facebook post announcing the app — are all over it. Initially, there are some frustrating bugs, including difficulty exiting the tagging mode and a general squirrelly feeling with the sliding panes, but it’s generally pretty great. 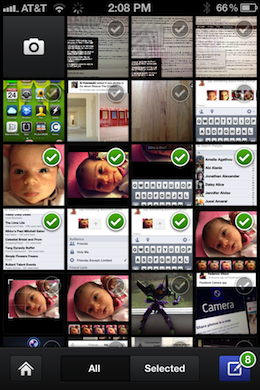 A couple of details stand out from the pack: Among those is the way that your camera roll is constantly peeking out. This invites you to check out the shots you’ve taken, with the Facebook Camera app or any other; simply pulling down on the timeline reveals more photos. The image picker also uses a brilliant riff on Apple’s ‘pick-multiple-items’ method by allowing you to directly select images, rather than having to tap the ‘share’ button first. This works because the primary action here is picking a photograph, rather than viewing it full-screen. Still very cool. Another great bit of design is the way that multiple photographs from the same upload set are displayed. As you scroll down the timeline, you can simply scroll across to look at a whole set of images, rather than having to tap on thumbnails or visit yet another screen to look at a gallery. I also love that the multiple uploader queues your images as a number on the upload button…very clever. The timeline is also used to emphasize the social aspects of Facebook. There is room for extended prose about your shots. Comments and likes are prominently displayed. It feels more verbose than Instagram’s feed by far, but it also serves as a constant reminder that you’re still a part of Facebook’s network when you’re here. Many of the photographs, especially initially, that you see are shared via Facebook directly or via other apps that hook into Facebook. 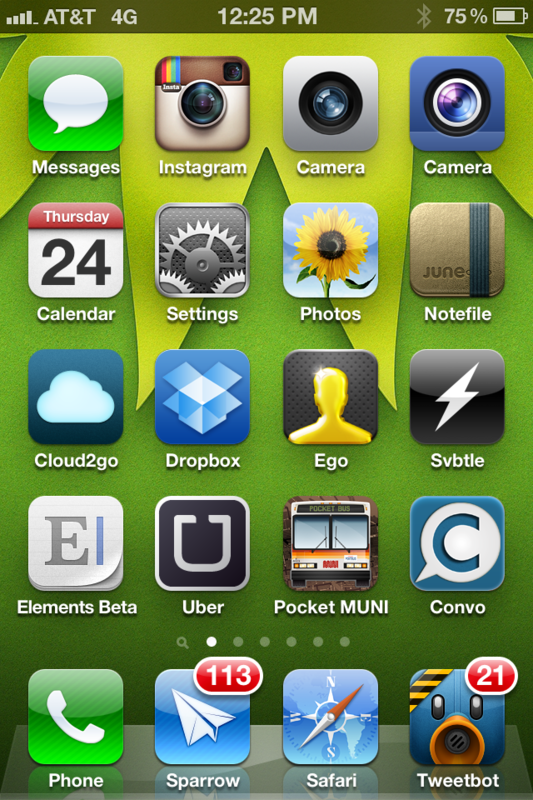 If you needed more evidence of the approach Facebook is taking with this, just look at the icon. Not only is it thematically and visually nearly identical to the stock iOS camera app, you’ll notice that its name is also simply ‘Camera’. I haven’t seen any other apps that display their name as just camera and I’m frankly a bit surprised that Apple allowed the app to use this. 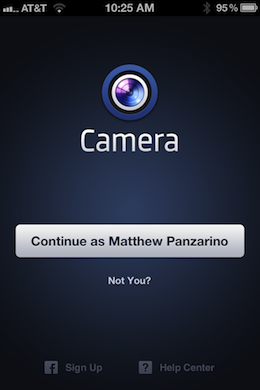 This is Facebook’s camera replacement app for the iPhone. While Instagram may have become that for many people, including me, you have to remember that Instagram only has some 57+ million users. Facebook has 900 million. Facebook Camera will become the primary camera app that a huge percentage of those hundreds of millions of users go to first in order to share photographs, period. 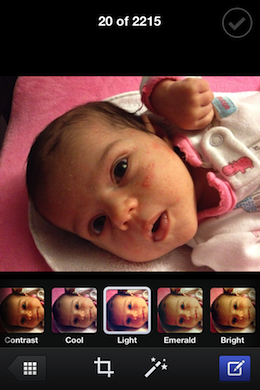 In fact, most of the photographs in my home timeline were originally shot in Instagram. But here I am looking at them in Facebook Camera. It makes it feel a part of the unified whole that is Facebook. But, more importantly, it makes it feel as if you’re not missing anything by using it. This also makes me curious whether we would be looking at a Facebook Camera app at all right now if Facebook and Apple had been able to come to an agreement to integrate Facebook uploading and account access in iOS 5, as was done with Twitter. Famously, Facebook’s onerous API constrictions when it came to Ping, revolving around charging for access, put the kibosh on those talks. Remember, too, that Facebook gets an enormous amount of information about its users via photographs. They’re location tagged, tagged with relationships and commented on by those in your network. 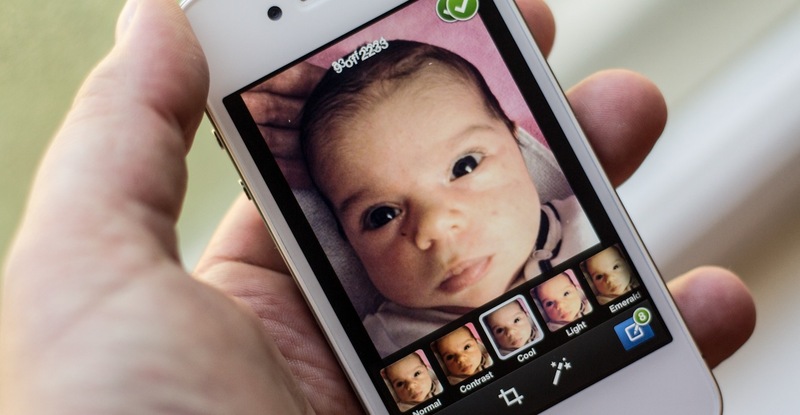 They’re also (at some point, if not yet) going to be processed for Facebook’s enormous facial recognition database. This is the reasoning behind making it incredibly easy (and it’s the easiest I’ve seen) to share multiple photographs to Facebook, all while gussying them up with some filtration magic. In order to make people comfortable about this, Facebook Camera puts the privacy settings face-forward, right in the posting dialog. You can choose exactly who gets to see your images, which is great. Regardless, Facebook still gets to see them, and your data. 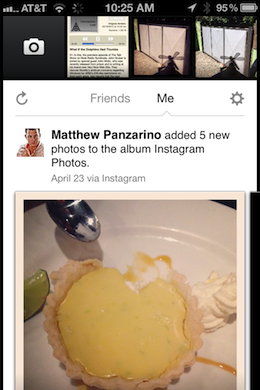 Instagram dishes up one image at a time, optionally to Facebook. 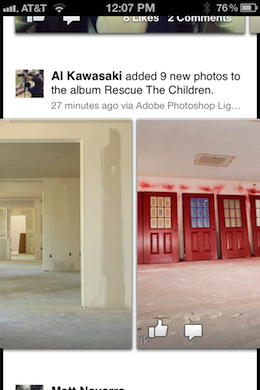 Facebook Camera uploads whole albums of filtered and data-rich photographs at a time. With Facebook Camera and Facebook Messenger, the company has created two splinters that magnify two aspects of the service as a whole, bringing them into better focus through the talents of acquisitions Sofa and social messaging app Beluga. But, to me, Facebook Camera seems the more significant of these. Remember that Facebook was built on the foundation of photos. If the company can use its user base to make it the default camera app of iPhone home screens then it gains a solid foothold on a rival platform, funneling in the exact content it needs to grow its service and its knowledge about its users. It’s the canonical Facebook+photography experience. If you’d care to share with your Instagram friends as well, that’s fine. 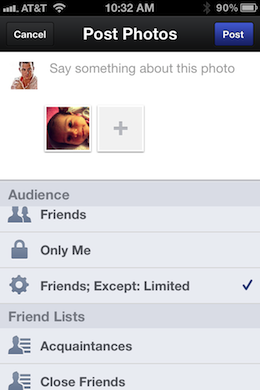 But Facebook wants you to know you’ll be able to see all of this activity in one place: Facebook Camera. Read next: Microsoft: Ballmer did not say we'll sell 500 million Windows 8 devices in 2013. Really. We promise.